On August 16th in Beijing, I had the opportunity to present a paper about Project Vox at the 24th World Congress of Philosophy. A world’s fair for all things academic philosophy, this conference by the International Federation of Philosophical Societies boasted an attendance of 8000 scholars from over 120 countries (figures cited at the Opening Ceremony), and held almost one thousand sessions on hundreds of topics. As an undergraduate, it was a scholarly chocolate factory where on top of exploring many topics, I was able to see some of my heroes and heroines in person. One of them was Judith Butler, who gave the Simone de Beauvoir Endowed Lecture on the first night of the conference. I gleefully took a seat in the plenary hall, along with thousands of other attendees, and awaited her lecture on the linguistic construction of gender across cultures. However, I was surprised instead with her quick, piercing remark about the Opening Ceremony before she began her presentation. She pointed out how at the ceremony that morning, there was a panel of distinguished officials, consisting of only men; the only women on stage were those serving tea to them. She then looked around the hall, and commented that the women here, the thousands of them wearing the badges indicating ‘Scholar,’ were not just to serve tea but to give powerful contributions to philosophy, too. The room erupted in a roar of solidarity. A fearless, proud, unapologetic “Yeah!” and claps shook the theater. What moved me the most was that the vibration of the room was not marked with spite, but with excitement and an affirmative presence of those who were there. A roar of all different pitches encapsulated that energy, and this set the tone for not only the rest of Butler’s lecture, but also rest of the week-long conference itself. As such, the energy of that hall still echoed as I excitedly but nervously talked, one Thursday morning, about the early modern women of Europe during my presentation. My allotted room was filled with twenty or so audience members, evenly split between men and women from various countries. Through the twenty minutes of sweaty palms and quivering lips, I talked about how women philosophers of early modern Europe had been unjustly neglected from our canon, and what current digital projects have risen up to the challenge of bringing them back into scholarly light—including our own Project Vox. To my relief, my presentation went as smoothly as I had planned. So when my slot ended, I sat back down, glistening, maybe with sweat, but definitely with pride. What? I looked around the room. It was true. The seats were scattered only with women now, emphatically marking the empty chairs where the men in the room had sat. All the men I saw when I looked around the room before were now nowhere to be seen. Only the men. When I was still trying to register what happened, a friend beside me added, “they all left one by one during your presentation…”. When I walked outside, I was even more surprised. The same people who had left were quietly and awkwardly standing around right outside the room. Not talking among themselves, or attending to anything particular, just lounging about. They were just waiting for the talk to be over. That evening, I left the conference center still wondering what had happened. Was it a reaction to the topic? Protest or indifference? I ruminated on what that implied about the current attitude towards the topic. However, following Noam Chomsky’s life philosophy that we always have a compelling choice for optimism over cynicism, I turned my attention not toward who walked out, but who remained in the room. That Thursday morning of my presentation, I recounted the lone female presence of Princess Elisabeth in her royal court full of male intellectuals; of Anna Maria van Schurman who had to be hidden away behind a curtain when she took classes with male students at the University of Utrecht; of Émilie Du Châtelet, whose name was silenced to befit the names of other men in her life; of all the other female luminaries who were reduced to biographical footnotes to their male contemporaries, not even as scholars of their own but only as love interests or distant fangirls who occasionally commented. These historical memories came to life even more powerfully as there was eventually an audience of only women in this biggest philosophy conference of the world. The issue is that early modern women thinkers of great philosophical influence were left out of the philosophical canon for unjustly non-philosophical reasons. The urgency is that it is our duty as their intellectual beneficiaries to restore them to their rightful scholarly exposure, not only for due respect for those figures but also due respect for our students and fellow researchers who are entitled to a fuller, more accurate understanding of our academic heritage. We at Project Vox believe that this is only possible with the united help of all our readers and other similar initiatives’ audiences. It is a collaborative process between everyone in the philosophical community to live up to what we owe to those before and after us. 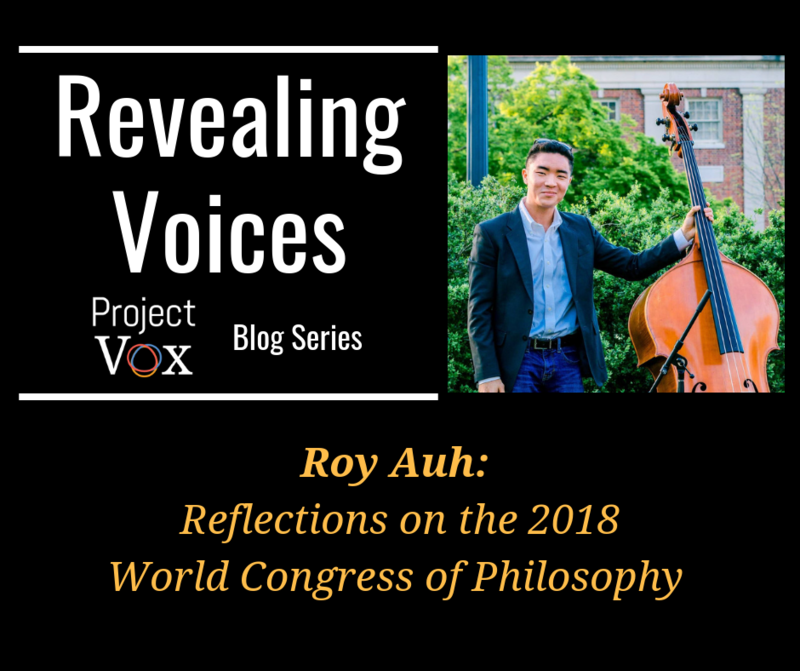 Roy Auh is a senior undergraduate student at Duke University, majoring in Philosophy and minoring in Literature and Music. He is currently the Lead Researcher (2017-2019) for Project Vox. He is also currently working in ethics, Chinese philosophy, and meta-ethics for his senior thesis.